I was chatting with a gal pal recently and the topic of feeling “joy” in our everyday lives came up. She had recently suffered an injury and was cooped up in the house and unable to socialize. For this dear friend, it was not a “smile-inducing” way to live. How important is this JOY thing to living? Joy, laughter, and play stimulate the release of feel good hormones in our body. It shuts down cortisol, adrenaline, and other health deteriorating processes in the body. Our body can’t heal when it’s in a state of stress. So, it makes sense that if you’re stressing about food, you aren’t healing. “Have you ever heard the old saying that laughter is the best medicine? Science is starting to prove that it’s true! Laughter sets off a chain reaction in the body that promotes physical and mental health. Laughter lowers stress hormones like cortisol and adrenaline. Laughter also strengthens the immune system and relaxes the nervous system. Laughter and play clear the mind and decrease anxiety and nervousness. So, what happened when I dropped the stress about food and just focused on cultivating gratitude and joy in my life? Pretty incredible things, actually. I’ve been where you are. Several years ago I was sick, and my kids were sick. I spent almost 10 years totally depleted and exhausted from chasing my tail in the world of natural healing. As you know, food is a huge part of natural healing. Somewhere early in my path of healing Hashimotos, adrenal fatigue, food intolerances, anxiety, and my son’s Autism Spectrum Disorder, food became more than just food. As I dived into research, everything I read pointed to food as the culprit of all my family’s health issues. I started worrying about every bite of food that passed our lips. Then started the downward spiral of jumping from one restrictive diet to the next. A lot of stress, time, and expensive food later, not much had changed. I felt even more exhausted than before. I had an overabundance of advice, but no real answers. It is hard to be a mother wanting to heal herself and her children, with nothing but conflicting opinions. Everywhere you turn, there is new information or “science” telling us what foods to eat and what foods to avoid. We see stories of how people have lost weight, gained weight, cured cancer, gotten cancer, healed pain, created pain, etc. – all through what they are or aren’t eating. We have given food so much power over our lives – particularly our health. And it’s exhausting people and causing a great deal of anxiety. I have had to work through this myself, and I see it with clients all the time. Well intentioned, health conscious people come to me overly stressed about food on a weekly basis. I’m here to say, it’s not the food, but the STRESS that’s making you sick. The stress is worse for your health than the food. A lack of joy can create ill health quicker than “bad” food can. The fear mongering in the alternative health community has taken its toll on all of us, and it’s time to step up and take back our joy! 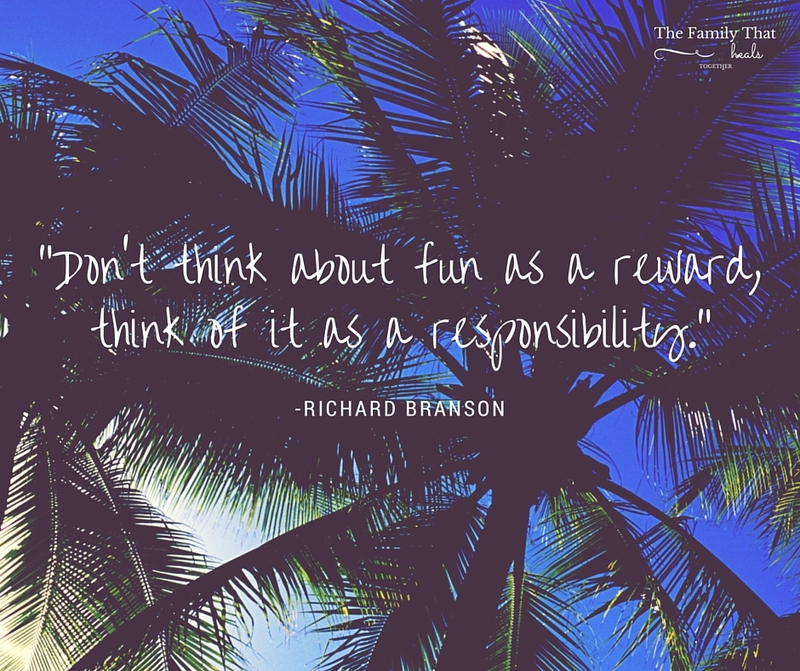 ‘Don’t think about fun as a reward, think of it as a responsibility,’ writes Richard Branson. So, what happened when I dropped the stress about food and just focused on cultivating gratitude and joy in my life? Pretty incredible things, actually. When I stopped believing I was broken, dropped the struggle, and finally let go, I HEALED. I was always searching for the big secret to my health. I thought there was one big mysterious puzzle piece that I had missed. And, there was. But, it wasn’t a superfood, a supplement, a modality, or anything like that. It was JOY. Sometimes we get so caught up in healing, that we forget to enjoy our lives. So, just for today, put the diet books down and go play. Have a dance party. Go the park. Play a game. Go to lunch with a friend. Watch a funny movie. Let joy fill your body, and watch your health transform! HAS TRYING TO EAT PERFECTLY ROBBED YOU OF JOY? WHAT INDUCES JOY IN YOUR LIFE? Hi! I’m smiling…..can you tell? Happy you are here. I'm Rosanna. I'm 64, living an active life and and NOT even considering "slowing down" regarding fitness, travel, great food, great wine, my Frenchie or time with Missy K! So, I decided to create a spot where anyone can come and find resources and hacks for their busy lifestyle. I'm saying no thank you to "replacements" of any kind and love real food and cold Champagne. Let's do more of everything and do it with style. Let's do this "next chapter" thing together! Come on fab ones, let's rock this and show 'em how it's done. Laugh more. Move more. Travel more. Ski more. Golf more. Be more. Live well and be BUBBLY! Be part of this amazing journey! WORLD TRAVEL & EVERYDAY LIFE…. GET YOUR DAILY DOSE HERE….. Follow and Join the Fun! 2017 Rosanna Jenkins. All right reserved.